Fresh lemon and lime on the nose, followed by freshly-baked bread, with bright acidity and richness on the palate with an extremely long, dry finish. Fresh lemon and lime are immediately apparent on the nose, followed by freshly-baked bread, resulting from the extended lees contact. 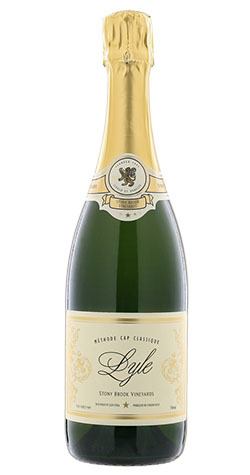 Bright acidity and richness on the palate give this MCC great balance with an extremely long, dry finish. This wine will age gracefully until 2026 and beyond. Méthode Cap Classique made only from Chardonnay grapes. The wine was matured in the bottle on the lees for 50 months before disgorging. 15% of the base wine was matured in French oak barriques, with reserve wine dating back to 2005. Only the cuvée fraction of pressed juice was used to ensure the purest and most elegant bottled product. Stony Brook Vineyards is a boutique, family-run wine farm in the beautiful Franschhoek valley, described by many as the food and wine capital of South Africa. The owners, Nigel and Joy McNaught, founded Stony Brook to satisfy their love of quality wines. Their son, Craig McNaught, now leads the winemaking with a dynamic and innovative perspective. The McNaught’s produce a range of wines in relatively small quantities, and in an environmentally-sensitive manner that reflects the unique micro-climate of this southernmost corner of Franschhoek.